PROGRAM DESCRIPTION: The inmates of Litchfield Penitentiary that you’ve come to know and love are all headed to the “max” when “Orange Is the New Black”: Season Six arrives on Digital June 10 and on Blu-ray™ (plus Digital) and DVD June 11 from Lionsgate. After inciting a riot in Litchfield, many of the familiar inmates are headed to maximum security for a “fresher and more surprising” (Ian Sandwell, Digital Spy) new season in a whole new environment. Starring Golden Globe® nominee Taylor Schilling (2015, Best Television Actress – Musical/Comedy Series, “Orange Is the New Black”), Golden Globe® nominee Kate Mulgrew (1980, Best Television Actress – Drama Series, “Mrs. Columbo”), Laura Prepon, and Golden Globe® nominee Uzo Aduba (2016, Best Supporting Actress – Limited Series or Television Motion Picture, “Orange Is the New Black”), who continue to please fans with “rich characters, ripping dialogue and great performances” (Dan Fienberg, The Hollywood Reporter). The “Orange Is the New Black”: Season Six Blu-ray and DVD will include audio commentaries with cast and crew, a never-before-seen featurette, and gag reel, and will be available for the suggested retail price of $34.97 and $34.98, respectively. OFFICIAL SYNOPSIS: Picking up one week after the emergency response team stormed Litchfield Penitentiary, the ladies of Litch have been torn apart, literally and figuratively, as they enter a new facility in the sixth season of “Orange Is The New Black.” Now ​newbies ​starting at the bottom, they ​must navigate new rules and power dynamics while getting hazed by inmates and tortured by guards. Friendships will be tested and new allegiances formed – some by choice, others by circumstance – as the women face a slew of charges from the riot. Will they take plea deals and turn on each other or band together and keep their bonds intact? I know, I’m late to the party on this one, but better late than never always applies, right?? I’m not a huge horror fan, so I tried to avoid this one like the plague. I’d watched the trailer and part of me wanted to watch the show, but the other part of me didn’t want to have nightmares for the next week, so I said NOPE! BUT, here I am. After finally giving in and watching it over the last few days, I’m here to tell you that if you haven’t watched this yet . . . DO IT!! What a great show! Everything from the story to the cast (both in past and present) to the directing to the effects was phenomenal. I was terrified, but also could not stop watching even when that one part of me really wanted to. As the synopsis mentions, Netflix’s THE HAUNTING OF HILL HOUSE follows the Crain family in two separate timelines. The first is the family of seven moving into Hill House as Hugh and Olivia Crain attempt to flip and sell it. The family begins to experience paranormal activity that seems to increase the longer they remain in the house. The second timeline shows the family, now adults, still attempting to deal with the aftermath of what transpired during their time at Hill House as children. Both timelines weave in and out together in a way that works perfectly with each episode’s progression. The show is loosely based on the novel of the same name by Shirley Jackson. Word to the wise . . . do not watch the show and then read the book trying to get answers you may not have received on the show! I’m only on the third chapter of the book, but these are two completely different situations. The book focuses on random people being invited to stay at Hill House, whereas the Netflix Original show focuses on the aspect of family and how these terrifying, traumatic events can cause a ripple in the lives of those who experience them. Fun Fact: While watching episode 8, “Witness Marks,” one of the scariest scenes for me, personally, literally took my breath away. Maybe 5 minutes after that scene, the lights in my house flickered. I didn’t mention it to anyone because I figured it was probably just in my head because this show is insane, but nooooooooooo. My mother and brother both said they noticed it also. Half of the lights in our apartment complex had gone out. Ladies and gentlemen, I don’t think you want to know what might’ve happened to me if the power had gone out in my apartment as I was watching this show. With that being said, I’m really surprised at how much I enjoyed watching this show. It’s one of those ones where you really can’t even attempt to try to figure anything out. It has twists and turns and you don’t know what’s real and what isn’t. You become invested in these characters, both as children and as adults. Kudos to Mike Flanagan for delivering a fantastic horror show that is terrifying and lovely and freakishly interesting with the perfect cast to go along with it. Well done! Why does Hugh Crain say that Hill House is the most dangerous for Steven? Why could the adult Crain children “speak” with Nell, but not with their mother? Why does it seem as though Nell was sort of targeted as opposed to any of the other children? Her and Luke experienced the most traumatic of the experiences, but I got the sense that the house wanted Nell to come home more than any of the other children. Also, I’m not sure if I missed something in my tensed-up, anxious state of watching, but, in the finale, why does Steven ask Hugh what he saw? He’d always been so fixated on what Hugh wasn’t telling the children about the night they left Hill House, but I feel like I missed what it was he was blocking out. Lastly, I want to know how it was for these younger children to film a show like this and have to say some of the things they had to say and see some of the things they had to see. Here’s to hoping they’re all just really great, young actors that won’t be scarred for life! If any of you have watched and have theories, please let me know what your thoughts were! It was also announced recently that there will be a second season titled The Haunting of Bly Manor to be released in 2020. Do you think they’ll bring back some of the same actors the way that American Horror Story does? I really enjoyed the casting for this show, so I’m kinda hoping they do! I am SO ready for Season 2!!!! Ok, maybe I’m not!! SYNOPSIS: The series revolves around Frank Castle, who uses lethal methods to fight crime as the vigilante “the Punisher”, with Jon Bernthal reprising the role from Daredevil. I can’t wait to see what happens this season! I mean, let’s be honest . . . Jon Bernthal’s portrayal of Frank Castle is one of the best ruthless vigilante performances and Ben Barnes as Billy Russo is that gorgeous villain you hate to love and love to hate lol. In a few interviews, Ben Barnes has said that “Jigsaw” will be more of a metaphorical concept now that he’s trying to piece together what happened. Not gonna lie, when I saw him all bandaged up at the end of the first season, I was worried about what he’d look like in Season 2. I’m terrible, I know. Don’t judge me! Season 2 is sure to have some more of the incredible chemistry between these two characters, along with some fantastic supporting roles. I can not wait! For now, enjoy the teaser trailer that Netflix released today. I’ve been a huge fan of OneRepublic for years now. I’ve even claimed that ‘Native’ is my favorite album of all time — yes, even above my all-time favorite Justin Timberlake‘s albums. They’re musical geniuses no matter how you break it down. I got to see them live once when they co-headlined with The Script a few years ago and it was one of my favorite shows I’ve been to. Now I’m just waiting for them to come down to Miami again! When I saw that a session from this documentary series with OneRepublic would be available on Netflix, I had to jump at the chance to watch it because why the heck wouldn’t I?? SYNOPSIS: Once In A Lifetime Sessions is an original and unique music documentary series giving viewers the chance to get up close and personal with some of today’s most celebrated music icons. Filmed on location at some of the greatest studios around the world, the Sessions highlight the craftsmanship, artistic depth, incredible skill and talent of the artists whilst also showcasing their catalogue. Each episode is dedicated to a single artist or group and features both an intimate live performance and a vinyl recording session. These are woven together with exclusive interview footage and a masterclass exploring the stories behind some of the most memorable songs of all time. Episodes include OneRepublic, Kasabian, George Ezra, Snow Patrol, TLC, Moby, Noel Gallagher and Nile Rodgers. Now streaming on US Netflix. In all honesty, I’d never heard of this series before this particular session, but I love shows like this. I used to love watching MAKING THE VIDEO and the DIARY series on MTV back in the day (I’m in my 30’s, don’t attack me lol). As a lover of music and entertainment, I loved being able to see the behind-the-scenes of it all. How things began as an idea and how that idea was actually put together for an artist. That’s what really fascinated me. Getting to know your favorite artists behind the music. This series reminds me of that. You get to learn a little more about OneRepublic from their own mouths and you also get to watch a few live performances of them on stage. I highly recommend check out this episode and also going back and watching any others that you can find! Personally, I’m hooked! Ladies and gentlemen, Netflix has finally announced an official release date for Season 3 of STRANGER THINGS! While our favorite kids will be in 1985, we’ll be able to enjoy the third season in its entirety on July 4, 2019 via Netflix. The teaser trailer and release date were available at midnight New Year’s Eve, which is a nice little tie in with the teaser. Are there any theories or predictions about what will happen in Season 3?? What are you most excited for? I’m still amazed at how Steve became one of our favorite characters lol. Check out the teaser trailer below and make sure to tune in to Netflix July 4, 1985 2019! December 20, 2018 December 20, 2018 by KristinLeave a Comment on “It’s Officially Official!” | The TO ALL THE BOYS I’VE LOVED BEFORE Sequel is Coming to Netflix! December 12, 2018 by KristinLeave a Comment on SURVIVE. IN 10 DAYS THE JOURNEY BEGINS. | A new BIRD BOX Trailer has just debuted! SYNOPSIS: When a mysterious force decimates the world’s population, only one thing is certain: if you see it, you take your life. Facing the unknown, Malorie finds love, hope and a new beginning only for it to unravel. Now she must flee with her two children down a treacherous river to the one place left that may offer sanctuary. But to survive, they’ll have to undertake the perilous two-day journey blindfolded. Academy Award® winner Sandra Bullock leads an all-star cast that includes Trevante Rhodes, with Sarah Paulson, and John Malkovich in BIRD BOX, a compelling new thriller from Academy Award® winner Susanne Bier. 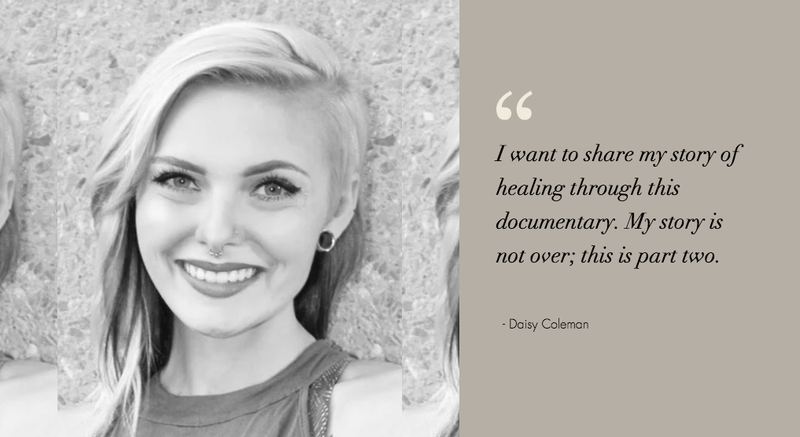 This is also not the only thing under their belt, as mentioned above, in addition to this documentary they have a feature film in the process, being written with many celebrities attached, based on Daisy’s life and a tribute to her younger brother Tristan Coleman, whom passed away on June 19, 2018. For more information and to follow this project visit savingdaisyfilm.com if you could donate anything they would be grateful, and if you can’t, please just spread the word and like the project. Mumbai hosted its first-ever global premiere for a major Hollywood film this week, as Netflix showcased Mowgli: Legend of the Jungle to an exclusive audience. Director and actor Andy Serkis walked the red carpet with his fellow cast mates Christian Bale, Freida Pinto, Rohan Chand and Louis Ashbourne Serkis. cast mates at the premiere. The Mumbai event marked the beginning of the Mowgli global tour, with screenings taking place in London and Los Angeles, before the movie premieres globally to Netflix members on December 7, 2018.
starring Kat Graham, Quincy Brown, Ethan Peck and Ron Cephas Jones. The film is directed by Bradley Walsh and produced by Brad Krevoy and Amy Krell. SYNOPSIS: A struggling but talented photographer inherits an antique holiday advent calendar, the contents of which seem to predict the future. Will this magical calendar lead her to love this holiday season? launches globally on Netflix on Friday, November 2, 2018. SYNOPSIS: OUTLAW KING tells the untold, true story of Robert the Bruce who transforms from defeated nobleman to outlaw hero during the oppressive occupation of medieval Scotland by Edward I of England. Despite grave consequences, Robert seizes the Scottish crown and rallies an impassioned group of men to fight back against the mighty army of the tyrannical King and his volatile son, the Prince of Wales. Filmed in Scotland, OUTLAW KING reunites director David Mackenzie (Hell or High Water) with star Chris Pine alongside Aaron Taylor-Johnson, Florence Pugh, Billy Howle, Sam Spruell, Tony Curran, Stephen Dillane and James Cosmo. NEVER LOSE SIGHT OF SURVIVAL | BIRD BOX Trailer has just debuted! October 24, 2018 by KristinLeave a Comment on NEVER LOSE SIGHT OF SURVIVAL | BIRD BOX Trailer has just debuted! SYNOPSIS: When a mysterious force decimates the world’s population, only one thing is certain: if you see it, you take your life. Facing the unknown, Malorie finds love, hope and a new beginning only for it to unravel. Now she must flee with her two children down a treacherous river to the one place left that may offer sanctuary. But to survive, they’ll have to undertake the perilous two-day journey blindfolded. Academy Award® winner Sandra Bullock leads an all-star cast that includes Trevante Rhodes, with Sarah Paulson, and John Malkovich in BIRD BOX, a compelling new thriller from Academy Award® winner Susanne Bier. Available on Netflix and in select theatres on December 21!